The Top 3 Hair Supplements? What are the three best hair growth supplements? It's the billion dollar question that so many men and women ask: Do hair health supplements actually prevent hair loss and boost hair growth? Before we get into this topic, it should be noted that there is no cure for hair loss. If a product or treatment claims otherwise, then they are being untruthful. A cure for common hair loss conditions, such as male/female pattern baldness or alopecia, would result in the complete reversal of the hair loss pattern. There are no products or treatments of any kind that are able to reverse baldness, therefore a cure has not yet been found. With that said, there are indeed products and treatments on the market that can help slow down the pattern of hair fall, as well as promote healthy hair growth. It should also be made clear that 'promoting hair growth' does not mean 'stimulation of hair growth where previously lost'. Hair loss products come in many forms, most commonly in supplements, foams, shampoos and liquids. But we ask, do these products actually do anything in the way of preventing baldness and thinning hair? In this article, we take a look at hair health supplements and the impact they are having in the hugely competitive, and rather bloated, hair loss treatment industry. We've covered a fair few supplements on The Comb Over, so if you're an avid reader of this blog, you'll get a fair understanding of where we stand on it, as experts. 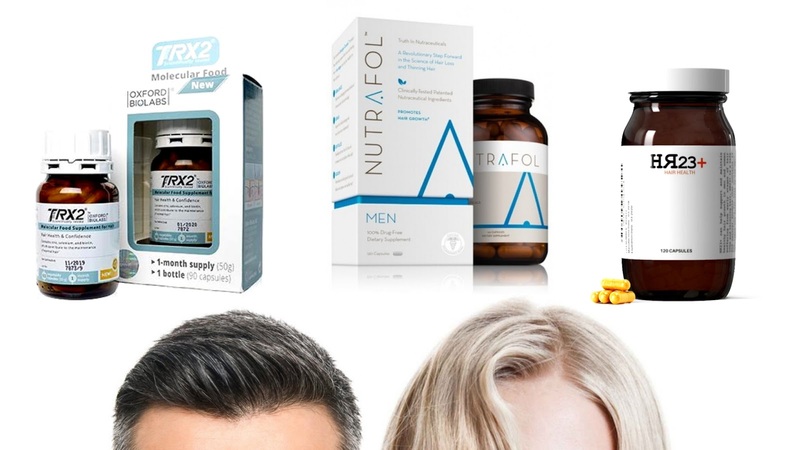 But if you're new to the hair loss industry and are seeking solutions for your baldness or thinning hair, then you'll probably have come across at least one of the three most talked about hair health supplements on the market - HR23+, Nutrafol and TRX2. So, what are these three hair supplements and can they really, and we mean REALLY, prevent hair loss and help sustain healthy hair growth? Well, let's take a look at each of these supplement powerhouses to give you an idea of what they are, what they claim, and most importantly of all, if they actually do work. What is it? : HR23+ is a new and advanced capsule that is designed to slow down hair loss and help promote stronger hair growth in men and women suffering from early stages of balding and thinning hair. HR23+ is packed with 23 key beneficiary ingredients that can block the production of DHT and encourage hair to grow thicker, stronger and faster. How does it rate? : Based on customer reviews and testimonials, HR23+ rates extremely well with their users, particularly with women battling thinning hair. How much does it cost? : HR23+ costs between £45-£50 per bottle, which lasts for one month. However, bottles can be purchased for as low as £35 if you buy this product in multi-pack deals. What's the science behind it? : The funny thing is, HR23+ seem keen to distance themselves from the 'science' factor, and instead focus on delivering a pure hair beneficiary supplement using tried, tested and proven ingredients that have shown to be effective for hair in past studies - what's more, they're all packed into one potent pill. What is it? : NUTRAFOL® - a 'smart' supplement, with natural nutraceutical ingredients specifically designed to target the multiple root causes of hair loss, including blocking the DHT hormone without any harmful side effects, revitalises and restores follicles to help prevent hair loss and reverse thinning hair. How does it rate? : Based on customer reviews and testimonials, Although not as convincing as HR23+, Nutrafol does rate moderately well with their users. How much does it cost? : Nutrafol costs around £60 per bottle, which lasts for one month. This does appear to be rather expensive, and there is no evidence of multi-pack savings deals. What's the science behind it? : NUTRAFOL® leverages the multi-dimensional properties of potent therapeutic plants, and their full spectrum of phyto-chemicals, which they suggest has the capacity to full their claims of blocking DHT and stimulating hair growth. What is it? : While conducting pre-clinical studies on hair loss, the researchers claimed they could stop hair loss and promote hair growth by combining powerful nutritional stimulants (Potassium, BCAA, Nicotinamide) with a pure form of a naturally-generated substance (L-Carnitine-L-Tartrate). This development targets the stimulation of potassium ion channels* within hair follicles. How does it rate? : TRX2 has a bit of a mixed bag as far as reviews go. The feeling suggests this supplement has gained far too many bad reviews and testimonials for it to be truly credible. How much does it cost? : TRX2 costs between £45-£50 per bottle, which lasts for one month. However, bottles can be purchased for lower if you buy this product in multi-pack deals. So, these are the best three hair supplements on the market, but which one will work best for your hair? As with any product you use, it really does depend on your genetics. As all these three products clearly state, results do vary with each individual. The question you should ask yourself is: Which one of these three supplements will work best on your hair? There's no doubt about it, each of these supplements must be in some way effective, because if they weren't, they wouldn't have repeat customers who can confirm they have noticed considerable change in their hair. Hair loss forums are filled with sceptical comments suggesting these types of hair products are scams, but we should consider each of our bodies react differently to different formulas. NUTRAFOL could work impressively on Patient A, but less effectively on Patient B. The same applies to HR23+ and TRX2. It really does depend on your genetics and your hair structure. Also, if you are completely bald and expecting a miracle cure for hair loss, then none of these supplements are likely to help you. Each of these supplements are designed for patients suffering from early stages of balding and thinning hair. The final decision is entirely up to you. Many people decide to trial each supplement for a minimum of three months, and then evaluate which one showed the most positive results. This is a long process but very effective in finding out which one works best for you. As stated above, reading user reviews and testimonials won't get you very far, because what works for some may not work for others. Cautions: Always consult with your doctor before taking supplements, especially if you are on medication. Also, check to see if you are allergic to any of the ingredients listed in a herbal supplement before using. Always purchase expensive supplements like these from the official company or reputable resellers.